In the world of online ordering software for restaurants, we believe that there is one provider which soars above the rest — in a variety of ways. 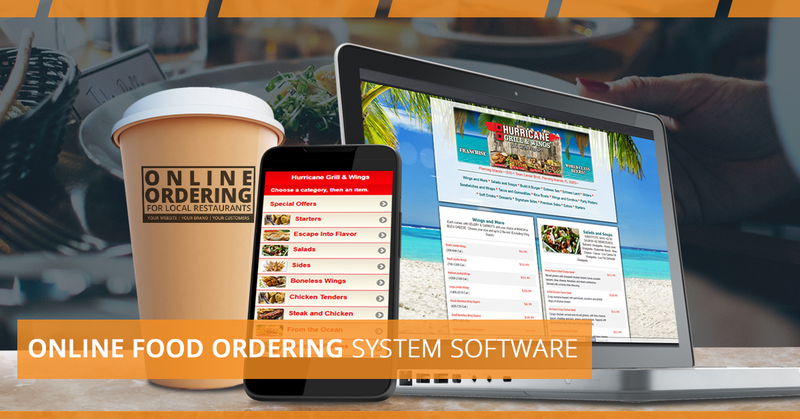 For one, Online Orders Now offers robust online ordering system software that directly and completely integrates with most every notable Place-Of-Sale system out there. We’ll speak more about that fact below, but for now, keep in mind that Online Orders Now sets our clients up for success in terms of being flexible with our mobile ordering system; we offer full-integration, semi-integration, and no-integration options. Essentially, this has the net effect that restaurant owners like to see – we’ll customize our online food ordering system to what our clients already have set up. For another, you’ll find that each and every feature which we’ve incorporated within our online ordering system for restaurants has a tangible, practical benefit for our clients. Integration with your POS system is one thing, but being able to offer one flat fee (irrespective of output-volume) is a hugely popular aspect of OON. Further, irrespective of whether we are building you a custom website, mobile app, or are designing a unique catering menu for your restaurant, you can rest assured that we will do our best to capture the essence of your brand. As you can tell from our demos, we are able to provide our customers with the digital facelift they need while still being true to the soul of the restaurants for which we provide our service. We at Online Orders Now provide sophisticated online ordering system software for restaurant owners all over the nation. Below you will find a bit more information about who we are as a company along with why we do what we do. And at the risk of tooting our proverbial horns, we want any and all prospective clients of ours to understand the reason(s) that so many other restaurants have elected to have Online Orders Now be their online food ordering system provider of choice. With that fact being established, we’ve been one of the most pioneering technological leaders in our field over the last decade. In particular, we were the first provider to offer seamless POS integration (we’ll keep bringing that up, since it’s a key point for most restaurateurs), phone number-based ordering, polygonal delivery mapping, and other integral features which have become fundamental for most modern mobile food ordering systems to have. And while these features are by-and-large considered to be standard offerings at this point, the point is that we were and continue to be innovators in our industry. To speak more about the present and recent innovations, we offer seamless loyalty integration, which involves offering responsive pages that conform to the customer’s device. Other examples include payment integration with every significant payment gateway, along with our intentionally affordable, fixed pricing. We will get more detailed below, but for now, we want our prospective clients to understand that we have your best interest in mind — and we can prove it too. While other food ordering system providers charge north of 20 percent in royalties for every mobile transaction that comes through your online ordering system, we offer three packages with fixed, monthly price-points. No matter how many orders you have, no matter how profitable you are — you are locked in when it comes to pricing. For those of our readers who aren’t familiar with how many of the organizations operate within our field, many of our customers find this to be a breath of fresh air. But to us, it’s simply the way things ought to be! We’ll provide a service for a reasonable fee, and you can continue to maximize profit from the delicious food you serve! It’s why we say our online ordering system can be found where value meets quality. Now that we’ve written a bit about the value-side of the equation, let’s discuss the quality portion. Below, we will describe our array of food ordering system products, features, benefits, and applications thereof. Toward the end of this comprehensive explanation, we’ll take the time to revisit the pricing/ROI conversation, highlighting what our customers can expect in terms of profitability. The long and the short of it is this: if you are interested in adding an easy-to-use, integrated online food ordering system in order to dramatically improve your revenue-generation approach, we are firmly in the camp that believes Online Orders Now is worth your consideration. And sure, we might be slightly biased, but allow us to explain why so many restaurant owners have started out as short-term customers only to become long-time clients. Keep reading to find out why and how so many restaurants are earning a significant amount of supplemental income with our advanced suite of benefits offered by our online food ordering software for restaurants! From a broad-stroke perspective, Online Orders Now offers a mobile ordering system that provides nearly every client we take on a close-to-immediate uptick in to-go orders, along with significant improvement in market penetration and a higher average ticket amount. Additionally, many of our clients are able to lower net costs because of the intuitiveness and functionality of our online food ordering system. When you couple how our product seamlessly integrates with most any POS system together with the fact that we provide custom website design, we really are able to push restaurants onto the front lines of restaurant innovation. Below we highlight the range of products and services on offer at OON. Naturally, we will lead off with our sophisticated restaurant ordering system — the fulcrum of our offerings. Unlimited Transactions – Whether your online orders amount to 100,000 or 100, you’ll pay the same fixed monthly rate when you choose to go with Online Orders Now. We can’t speak for every company in our industry, but we can control how we operate. Instead of charging a royalty percentage on each transaction, we’ll keep things predictable so you can continue to grow your business. With no hidden fees based on volume or any other metric, going with OON makes a lot of sense. External Delivery Service – We can help you close the look with regards to paper trails between third-party companies that you might use for deliveries and your business. After each individual delivery order, we’ll send your third-party provider of choice a copy of the order by fax or email to ensure that there is appropriate documentation of each transaction. Administration Back-End – Our food ordering system for restaurants is full-service. Practically speaking, this means we offer our clients a self-sufficient product, which is to say that we will do the work for you. Our products are remarkably intuitive, which allows restaurant owners the ability to spend less time worrying about their online ordering system and more time running their restaurant. However, if you are the kind of person who would prefer a more hands-on approach, we can certainly respect that. The good news is that we’ve incorporated the capacity for our clients to do exactly that, with an administrative web interface that’s included in our standard features. Restaurant managers can make real-time changes to aspects of their restaurant that include delivery times, holidays, item descriptions, business hours, item descriptions, and more! You are set up for success, irrespective of how actively involved you want to be with your custom website and online ordering system software. First-Time Customers Emailed – The moment when you get a first-time customer is key to the success of your business. We’ll automatically email you so that you can send them whatever special offer you are running at the moment. That way, you can keep your brand and delicious menu items top-of-mind so that your first-time customers will quickly become regulars! As we noted above, we do more than simply provide online food ordering solutions for our clients. We want to make sure our clients are set up for success with regards to their entire digital appearance, and a massive piece of that effort involves giving our clients a custom website. When we redesign your website, we will do our due diligence to make sure that we capture the spirit of your restaurant — capturing the essence of our customers’ brands is one of the aspects of our website design that our customers appreciate the most. That way, our clients’ customers will be familiar with the website when it has the same imagery and branding. But if you are sitting there, reading about Online Order Now, thinking to yourself, “We already have a website with our menu updated on it, and I don’t really feel like going through the rigamarole that a project like that would entail,” we can’t reiterate the following point enough — even if you already have a website, it’s probably time to update your website so it meets the expectations of your many customers. You see, websites are not unlike cars in one key way: both require maintenance after a few years to do the job they are intended to do. What’s more, the modern-day consumer has come to expect a whole lot when it comes to website performance. Websites must be mobile-optimized to be considered usable. So sticking with a boring, difficult-to-navigate, HTML-based website while your competitors boast mobile-responsive websites that naturally lead visitors to convert, will leave you eating their dust. Essentially, doing so is akin to driving Henry Ford’s Model-T while other restaurants in your area are zooming by you in a Chevy Corvette. However, that’s as far as the metaphor can take us — and that’s good news. You don’t need the equivalent of a Corvette to be competitive in your market. You simply need a bit of a facelift to make sure that you have updated functionality. Below you’ll find some of the more modern features you yourself can boast about should you choose to go with us for your custom website design for your restaurant. Contact Form The odds are strong that you probably already have a contact form on your website. But in case you don’t, all our websites come with a contact form as standard issue. While some restauranteurs aren’t concerned with connecting digitally with their customers, it remains the case that folks need to be able to have a place to provide feedback, even if that place is digital in nature. If you don’t offer a way for your customers to get in touch with you, it reflects poorly on your business. In addition to a contact form, we’ll ensure that your phone number is clear. Who knows, perhaps the majority of feedback you receive will be positive, and you can use those testimonials in your marketing efforts! Social Networking Links While it might not be the first thing you think of when you get a website redesign, having social networking links included on your site is as close to essential as you can get. Though it might not make or break the success of your business, having prominent links to your Facebook, Twitter, Yelp, Foursquare, and other social media accounts lets your customers know that you are actively engaged in the digital world of the 21st-century. What’s more, they can use these links to research your restaurant through the review platforms you’ve provided them the link to follow. Search Engine Optimization Search Engine Optimization, knowns as SEO, does happen to be a fundamental contributor to the success of any website. We orient your website to be indexed by all major search engines so that you can rank for appropriate search terms related to your restaurant and brand. This gets your free website traffic — while other marketing channels might have you pay for each click, SEO traffic is organic, and is therefore free! Image Slider Image sliders fall under the category of being somewhat commonplace among many websites, and yet that isn’t always the case in the restaurant industry. When you go with Online Orders Now, you’ll get quality imagery on your website’s homepage that showcases your restaurant’s particular strengths. Whether that be your joint’s delectable food choices, delightful staff, or your unique atmosphere, you can capture your brand’s essence and draw in folks who are still in “research mode” online. Google Map Many of your website visitors will already be convinced that yours is the place they’ll find their next meal. They might just have hopped onto your site to remind them where you are located. With OON and our website redesign, we’ll make sure your customers can see where you are located through an integrated Google Map widget. Instead of listing an address and making your potential customer go through the added step of copying the address into their phone so they can paste it into a maps application, your future guests will be able to see your exact location from your website! Simply put, the more intuitive you can make any process on your site (be it ordering food or finding your physical location), the more guests you will ultimately serve. We think we can all agree that do so is a very good thing! Embedded Videos If you already have a few videos hosted on Youtube or Vimeo, we can get those on your site with no trouble. Having dynamic content like videos not only improves how well your website appears to your customers, but it will help with your organic SEO rankings as well. Every little bit helps, and we leave no stone unturned at Online Orders Now. Whether you found our site looking for “food ordering apps for restaurant,” or a “restaurant online ordering app,” we’ve got you covered. We are able to build you a mobile web app with your restaurant theme included! You’ll get all the same features that we listed above, from the dynamic image sliders to social media links to the ability to embed videos on your tailored app! As attractive as having your own dedicated web app might be, it’s safe to say that not each of your customers will be interested in downloading an application that is only for ordering from your restaurant. Likewise, not everyone will be using a desktop or laptop computer to place their order. Most people, as you likely already know, will be using a mobile device to do so — typically their smartphones. We offer mobile ordering for restaurants. That is, we will make sure your website is optimized for mobile devices so that they receive an ideal ordering experience. We utilize the most up-to-date frameworks to offer a mobile-friendly format with exceptionally fast load times and a bandwidth-friendly format to increase the overall speed of your website (another key to improving your SEO rankings). So no matter if your website visitors are ordering from a desktop, laptop, or phone, we’ve got you covered with our comprehensive online ordering software for restaurants. Another product we offer is the dynamic printable menu. OUr restaurant menu app lets in-person customers browse a physical version of your restaurant’s menu before they order, should they so wish. Our Dynamic Printable Menu, or DPM, ensures that your guests will get copies of your most recently updated menu. While industry-standard practice sees most restaurants able to print out a PDF of your website’s menu, ours at OON is always synchronized with any changes you happen to have recently made. For our clients who offer catering services, or for those who are considering doing so, we offer the functionality to set you up with a uniquely dedicated catering menu. While catering is a great way to supplement your bottom line, it’s safe to say that implementing such a service is not without its own set of challenges. We have the experience and expertise that counts in this industry — our menu is complete with its own pricing, menu items, and quantities. You’re also able to change your service area’s parameters, in case you want to expand or constrict what areas you’re willing to travel to for a particular event. As is the case with all of our offerings, we’ll put you in control, making sure we capture the unique aspects that set your restaurant apart from the competition! Non-Integrated Ordering Options Even if you don’t want to integrate with your POS system, we can still set you up for success through your printer or fax machine. Non-Exclusivity You can use whichever food delivery providers you’d like to without worrying about us throwing a fit over it. We want you to be successful! Discounts, Special Offers, Packages, And Combos Regarding discounts, you are able to choose a dollar figure or a percentage off of the original cost of an order’s total. You can either require a code or can require a minimum purchase amount before getting access to this discount. Our combos, special offers, and other packages can also be set up to run during select times and days of the week. You can also customize your online ordering experience to involve special pop-up boxes at the checkout page. The same customizable features we mentioned regarding discounts are also available for these special promotions. Order Accuracy With our mobile food ordering system, customers can take their time while selecting the menu items they’d like to include in their order. Because they’re able to enter in the order themselves, usually from a place of comfort, there is a greater chance that their order will be accurate (and greater in purchase price, which we will discuss later). This is also due to the fact that our restaurant ordering system lets customers personally confirm their order’s accuracy before it is placed. Fewer mistakes mean fewer unhappy customers, which is obviously a great thing. Likewise, our online food ordering software is such that all online orders go directly to email/fax/text notification so that you will not miss an order — even if there is a POS or internet failure, we’ve got your back! TIPS Functionality Customers can tip you right on the checkout page. While that might be more “standard-issue“ than impressive, the beauty is in the ability to customize tip-percentage options. We can default a tip percentage to 15 or 20 percent to level-set the expectations of your customers, as you might have seen at any number of retail stores. This is great because they can manually enter in their preferred amount, so their autonomy is not infringed upon! 30 Percent Larger Tickets You read that right — your customers who order online have an average ticket size that is 30 percent larger than in-store, over-the-counter sales typically are. This is because customers usually feel more comfortable when they can order from their home, or wherever they happen to be. They’ll be able to browse the menu while taking their sweet time, as opposed to worrying about a line forming behind them in a new environment. This means more revenue for you, and that is the ultimate goal. “My Way” 30-Second Ordering Our clients consistently tell us about how much they love this feature. Our mobile ordering software includes the functionality to store exactly how each menu item was ordered from a particular customer’s profile. Every time a customer comes back to a menu choice they’ve ordered before, they can choose to edit or add that item to the cart with the same modifications they set up the last time they ordered it. Marketing Data We can orient our online ordering system to be such that customers are required to provide their name, address, and zip code in order to complete an order. This is important marketing data that you can use to your advantage. Accessed by either contacting us for it or finding it in the Admin, you can integrate this customer information with your POS. There, customer data automatically sent and saved in your POS system with every order that comes through. OON provides seamless integration, which entails the loading of our mobile ordering software onto your POS. Once orders are captured by the POS, the ticket information is automatically printed on up to five printers of your choice. All orders are sent to admin backup and email. If your internet happens to go down, we have safety measures in place to make sure you don’t miss out on any orders. With unlimited fax backup and text notifications, this feature is standard and comes with whatever package you choose. All credit card orders go directly to the merchant processor of your preference. We’ll send you an email for confirmation. Believe it or not, we are only scratching the surface when it comes to describing the wealth of features and benefits our food ordering system for restaurants has to offer restaurant owners of all kinds. But when it comes to pricing, you will find the breakdown not only highly profitable but also highly reasonable! Whichever package suits you best, rest easy knowing that you can always upgrade to fully integrated at a later time. As the graph below illustrates, we at OON offer our clients the chance to experience real growth. Our online food ordering system has been designed to help restaurants reach new heights in terms of revenue. 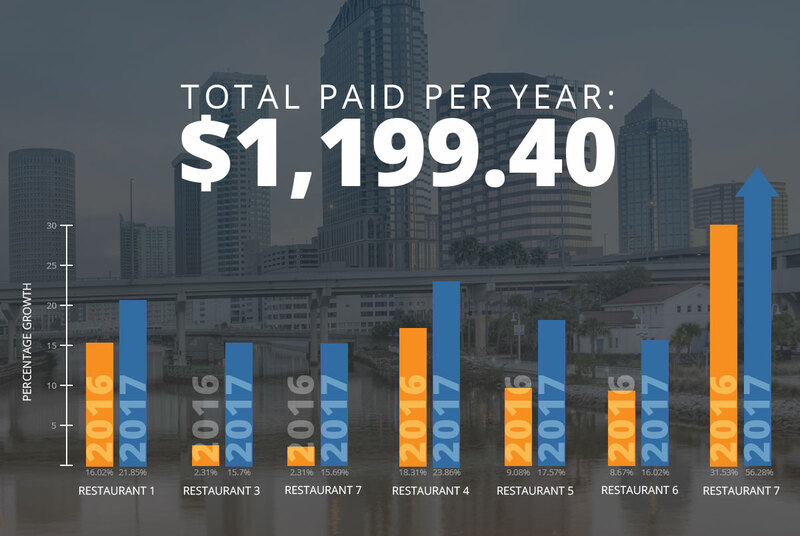 And while we aren’t able to guarantee the kind of growth that “Restaurant 3” has shown, the yearly uptick in revenue that each of these randomly-polled restaurants has shown illustrates the general impact adding our products and services often provides. 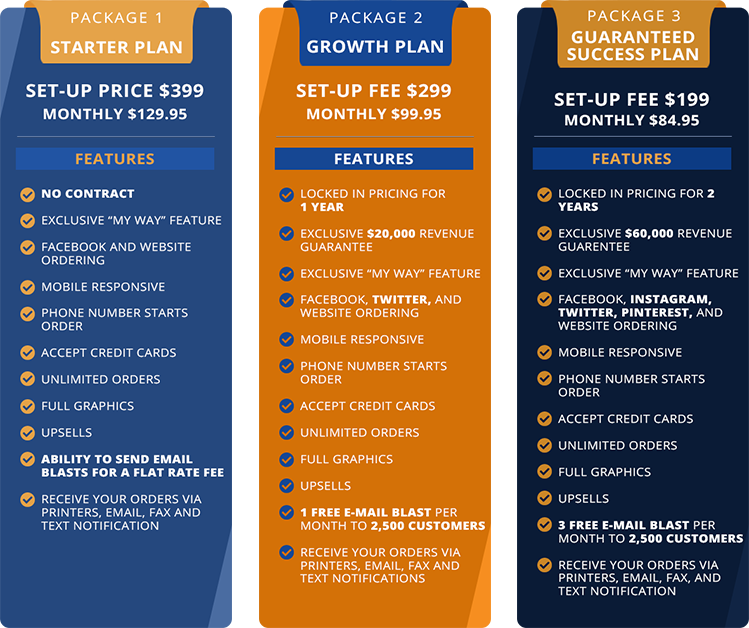 What’s more, we offer a $20,000 Additional Revenue Guarantee (in your first year) for customers who go with our Guaranteed Success Plan. If you don’t experience 20,000 in 12 months or $60,000 in 24 months, we’ll cut your menu monthly fee in half until you get to those numbers in the same period of time! What’s more, we’ll work with you to make sure you are getting the most bang for your buck with regard to our features. When you work with Online Orders Now, you aren’t just getting a product, you’re getting a dedicated team of experts who are willing to work with you to optimize your restaurant’s mobile ordering system! Most restaurants experience about 30 percent growth within the first year of adding our restaurant online ordering software. If you’d like to count yourself among those who have switched to OON and taken advantage of our online food ordering system, reach out to us today to get started! Keep in mind that you can view a demo of a few of our restaurant menus as well. And to see all available features, call us at 813-549-7010 ext. 1 for a full demo and walkthrough!